Plans have been announced, with implications for Marlow Bridge, in the event of a no-deal Brexit. The expected delays at ports are likely to have knock on consequences for movement of freight vehicles throughout the country, and the Government has announced that emergency legislation will be brought in to facilitate journeys. 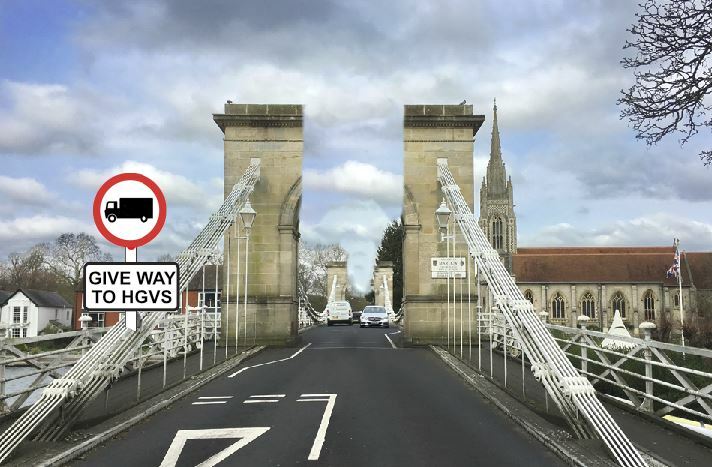 In Marlow, this would include permitting HGV lorries to cross the bridge – overriding the current 3 tonne limit. Most of you will be aware that in 2016 an HGV attempted to cross, as we reported in detail at the time. On its way over, some damage occurred to the concrete arches at either end. To avoid the risk of this occurring under the new legislation, the bridge may need to be modified – raising the arches or maybe removing them completely. The volume of HGVs crossing will be monitored, and if necessary, steps to discourage car users may need to be introduced, given that the priority is ease of movement of goods within the UK. Controversially, this could result in having a toll for vehicles weighing LESS THAN 3 tonnes. Next articleMarlow gets a Spring Clean, and a Wombles story…..